At the close of the rehearsal today Gelb addressed the company to alert them that trouble is expected Monday night. Police will be on standby. Big demonstration expected on Amsterdam Ave.
No visitors will be permitted backstage– no friends, family, fans, agents, etc. Nobody! Be sure to carry company ID cards. If there is an interruption in the audience the cause will be found and removed. If necessary the music will be stopped and resumed after disturbance removed. High security in house. There are eight performances of Klinghoffer. for taking this stance . Allowing the performances to go on is his fall back position. There isn’t much to be commended about it. The only other opportunity he had left to be an example of leadership was to allow the “Met Talk” to go on so some genuine dialogue about the opera and what it is trying to convey could take place. THAT would have shown true courage and leadership. So, Gelb is preparing for tactics usually employed by the pro-Palestinian side. Both the NY Times and Washington Post have reported that ticket sales for the work have been slow. So, the market may determine the fate of this opera, at least at the Met. I doubt it is the market which determines ticket sales. Rather, it is willful ignorance. A shame for New York and the Met. He should do a play celebrating 9/11, or the murder of blacks by the KKK next. Artistic freedoms!!!! So, this opera’s intention and idea is to celebrate the murder of Mr. Klinghoffer? It would be interesting to see some arguments for that. Do not speak of that about which you know nothing. It it refreshing to see an opera make such a dramatic impact. I wish them well. The protesters have apparently rented wheelchairs from which they plan to demonstrate (and discuss the nuances of the libretto and score, no doubt). If that’s true, it may well backfire. It is said that former mayor Guliani – that paragon of opportunism-will be a leading the protests. I’m sure he’ll mention 9/11. I was never that upset by canceling the HD broadcast-without this publicity, it was a goofy choice where the average age of attendees is 65-but it is wrong that there is no Sirius boradcast, Met stream, or regular radio . He has earned some respect by not canceling the opera-the pressure in the NY area must have been enormous-and going forward with proper precautions is the right move-and an assertion of artistic freedom. The protestors have their rights-and that should be protected-I just hope they don’t disrupt the performance. I imagine that the production will be recorded and HD-filmed, even if the broadcast(s) of same have been cancelled. Go and experience the opera instead of trolling around here. I think the intention was to ignore those who would insinuate that this opera is anti-Semitic. The idea is preposterous and giving these confused people a platform on which to vent their nonsense is simply political correctness taken to the extreme. The triumph of the new totalitarianism, called political correctness. How about writing a beautiful opera justifying Sirhan Sirhan and calling it Death of RFK? Truly that could be a magnificent opera celebrated by all in NYC. To M.Ahnko – Have you seen The Death of Klinghoffer? 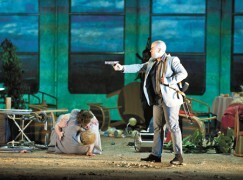 The opera does NOT glorify the murder of Mr Klinghoffer. Rather it attempts to show that two different peoples caught in a terrible struggle are comprised of human beings who both have aspirations, hopes and dreams for their lives and those of their children. They are also two peoples who have anger over being displaced or cast out from their homes, fear of what might happen to their families and can be hurt like everyone else. They are two peoples who desperately want to get on with the business of life, but cannot find the way side by side. But they share one very simple truth. They both share the human condition. If the opera comes off as biased toward one faction more than another it is only through some weakness of dramatic device within the work itself, not malicious intent. Two different peoples? Mr. Klinghoffer was an American, So was Robert F. Kennedy. Both were murdered by Palestinians. What human condition did Misters Klinghoffer and Kennedy share with their murderers? The only struggle Mr. Klinghoffer – in his wheelchair – was in, was with his murderers. By creating a false dichotomy and by attempting to create moral equivalence between murderers and American victim, the opera is by definition biased.